The Community Data Management System is an object-oriented data management system, specialized for organizing multidimensional, gridded data used in climate analysis and simulation. CDMS is implemented as part of the Climate Data Analysis Tool (CDAT), which uses the Python language. The examples in this chapter assume some familiarity with the language and the Python Numpy module (http://www.numpy.org). A number of excellent tutorials on Python are available in books or on the Internet. For example, see the Python Foundation’s homepage. Square brackets represent the slice operator. Indexing starts at 0, so u selects from variable u for the first timepoint. The result of this slice operation is another variable. The slice operator can be multidimensional, and follows the syntax of Numpy Python arrays. In this example, u[0:10,:,1] would retrieve data for the first ten timepoints, at all latitudes, for the second longitude. Variables can be used in computation. ** is the Python exponentiation operator. Arithmetic functions are defined in the cdms2.MV2 module. Operations on variables carry along the corresponding metadata where applicable. In the above example, vel has the same latitude and longitude coordinates as u and v, and the time coordinate is the first time of u and v.
A variable can be obtained from a file or collection of files, or can be generated as the result of a computation. netCDF, HDF, GrADS/GRIB (GRIB with a GrADS control file), or PCMDI DRS. A coordinate axis is a variable that represents coordinate information. Typically an axis is associated with one or more variables in a file or dataset, to represent the indexing and/or spatiotemporal coordinate system(s) of the variable(s). Often in climate applications an axis is a one-dimensional variable whose values are floating-point and strictly monotonic. In some cases an axis can be multidimensional (see Grids). If an axis is associated with one of the canonical types latitude, longitude, level, or time, then the axis is called temporal . An axis in the domain of a variable need not be spatiotemporal. For example, it may represent a range of indices, an index coordinate system. The latitude and/or longitude coordinate axes associated with a variable need not be elements of the domain. In particular this will be true if the variable is defined on a non-rectangular grid (see Grids). Attribute values can be strings, scalars, or 1-D Numpy arrays. In general internal attributes should not be modified directly. One exception is the id attribute, the name of the variable. It is used in plotting and I/O, and can be set directly. Optionally, variables have a mask that represents where data are missing. If present, the mask is an array of ones and zeros having the shape of the data array. A mask value of one indicates that the corresponding data array element is missing or invalid. When data is read from a file, the result variable is masked if the file variable has a missing_value attribute. The mask is set to one for those elements equal to the missing value, zero elsewhere. If no such attribute is present in the file, the result variable is not masked. When a variable with masked values is written to a file, data values with a corresponding mask value of one are set to the value of the variables missing_value attribute. The data and missing_value attribute are then written to the file. file variable is a variable associated with a single data file. Setting or referencing a file variable generates I/O operations. dataset variable is a variable associated with a collection of files. Reference to a dataset variable reads data, possibly from multiple files. Dataset variables are read-only. transient variable is an in-memory object not associated with a file or dataset. Transient variables result from a computation or I/O operation. Typical use of a file variables is to inquire information about the variable in a file without actually reading the data for the variables. A file variable is obtained by applying the slice operator  to a file, passing the name of the variable, or by calling the getVariable function. The third type of variable, a dataset variable, is associated with a dataset, a collection of files that is treated as a single file. A dataset is created with the cdscan utility. This generates an XML metafile that describes how the files are organized and what metadata are contained in the files. In a climate simulation application, a dataset typically represents the data generated by one run of a general circulation or coupled ocean-atmosphere model. CDMS defines a rich set of grid types to represent the variety of coordinate systems used in climate model applications. Grids can be categorized as rectangular or nonrectangular. A rectangular grid has latitude and longitude axes that are one-dimensional, with strictly monotonic values. The grid is essentially the Cartesian product of the axes. If either criterion is not met, the grid is nonrectangular . A curvilinear grid consists of a latitude and longitude axis, each of which is a two-dimensional coordinate axis. 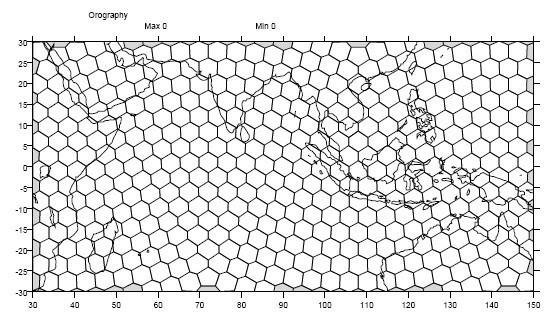 Curvilinear grids are often used in ocean model applications. A generic grid consists of a latitude and longitude axis, each of which is an auxiliary one-dimensional coordinate axis. An auxiliary axis has values that are not necessarily monotonic. As the name suggests, generic grids can represent virtually any type of grid. However, it is more difficult to determine adjacency relationships between grid points. The domain of variable sample is ( y , x ) where y and x are index coordinate axes. The curvilinear grid associated with sample consists of axes ( lat , lon ), each a two-dimensional coordinate axis. To interpolate from one rectangular grid to another, use the built-in CDMS regridder. CDMS also has built-in regridders to interpolate from one set of pressure levels to another, or from one vertical cross-section to another. To interpolate from any lat-lon grid, rectangular or non-rectangular, use the SCRIP regridder. To interpolate between any lat-lon grid types, the SCRIP regridder may be used. The SCRIP package was developed at [Los Alamos National Laboratory] (http://oceans11.lanl.gov/drupal/Models/OtherSoftware). SCRIP is written in Fortran 90, and must be built and installed separately from the CDAT/CDMS installation. Obtain or generate the grids, in SCRIP netCDF format. Run SCRIP to generate a remapping file. Read the regridder from the SCRIP remapping file. Call the regridder with the source data, returning data on the target grid. Steps 1 and 2 need only be done once. The regridder can be used as often as necessary. Regridding is discussed in Chapter 4. CDMS provides extensive support for time values in the cdtime module. cdtime also defines a set of calendars , specifying the number of days in a given month. Time types are described in Chapter 3. Data read via the CDMS Python interface can be plotted using the vcs module. This module, part of the Climate Data Analysis Tool (CDAT) is documented in the VCS reference manual. The vcs module provides access to the functionality of the VCS visualization program. Initialize a canvas with the vcs init routine. Plot the data using the canvas plot routine. By default for rectangular grids, a boxfill plot of the lat-lon slice is produced. Since variable precip includes information on time, latitude, and longitude, the continental outlines and time information are also plotted. 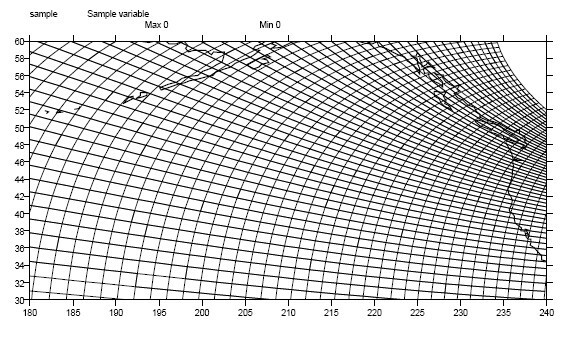 If the variable were on a non-rectangular grid, the plot would be a meshfill plot. The plot routine has a number of options for producing different types of plots, such as isofill and x-y plots. See Chapter 5 for details.